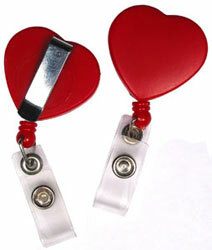 HEART SHAPED BADGE REELS ON SALE NOW! These unique badge reels in the shape of a heart are perfect for nursing and other medical professionals. for only $1.35 ea.! Made from durable plastic and feature a sturdy metal belt clip on back. A 32" retractable cord with vinyl strap is provided for attaching id cards and id holders. Custom imprinted heart badge reels are also available. For more information about badge reels and custom imprinting methods visit our Badge Reel Articles page. Some of the more common questions about badge reels are answered on a Badge Reels FAQ page.